Hywind Scotland is capable of generating enough energy to power 20,000 homes. 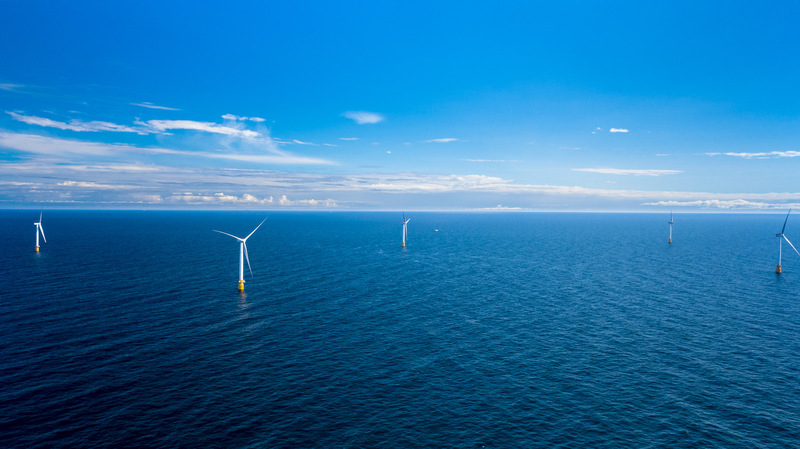 The blades of five huge turbines have begun spinning on the world's first floating offshore wind farm, located over 15 miles off the coast of Peterhead, Aberdeenshire in Scotland. First Minister Nicola Sturgeon is cutting the ribbon on the renewable energy site today -- presumably in an on-land ceremony -- which is capable of pumping 30 megawatts of clean electricity into the grid. In more human terms, that's enough to power approximately 20,000 homes. The turbines of Hywind Scotland stand 253 meters tall in total (around 830 feet), with 78 meters (256 feet) of that bobbing beneath the surface, tethered to the seabed by chains weighing 1,200 tonnes. It's quite the feat of engineering, with the obvious benefit of floating wind farms being the inhospitable environments in which they can be erected. Energy firms Statoil and Masdar partnered on the Hywind Scotland project, and the plan within the next year or so is to install a huge 1MWh "Batwind" storage battery to better manage the site's output. The UK, and Scotland in particular, is no stranger to trend-setting clean energy projects that are contributing towards encouraging renewable milestones. The UK is home to the biggest wind turbines in existence, and after Hywind Scotland, the Irish Sea is expected to host an even bigger offshore wind farm in the future. Then there's the world's first lagoon power plants, still in development, and while England doesn't really have the right weather, windy Scotland has also been earmarked for the world's first commercial kite-driven power plants.